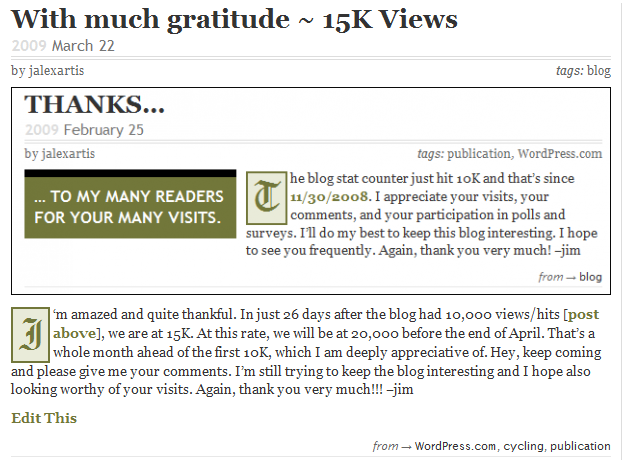 Again, I say thank you so very much for your readership. It was only 27 days ago that we were at 15,000, and 26 days before that, that we were at 10, 000 hits—now 20K, after only 20 weeks following the consolidation of my blogs and publishing them here at WordPress.com. The experience is indeed fun. I love interactive blogging. Your comments are inspiring and give me the opportunity to communicate directly with you. So, please keep them coming. Congratulations on yet another milestone. Obviously, people are finding good stuff to come back to and enjoy/learn. I certainly enjoy checking in and watching the builds and seeing what is going on. I’m looking forward to the fairing project for Silk!